An address plaque in the shape of a leaf would be pretty amazing, but it would be a leaf. What you really want are leaves, lots and lots of lovely leaves. 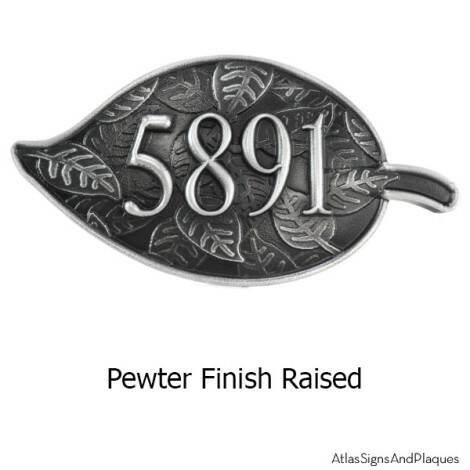 And now you can have exactly that with the Lots of Lovely Leaves Address Plaque. First look at the shape. It is a leaf with your address numbers in clear-cut 3D softly rounded numbers. Beyond that, the sign’s background is filled with an array of smaller 3D leaves making this the most unusual nature themed address plaque ever. For other 3D address plaques, please click here. Love This? Go Tell it on a Mountain! This entry was posted in NEW - Be in the KNOW and tagged 3D, address, Address Plaque, custom, decorative, finished, home decor, leaf, leaf shaped, leafs, metal coated, personalized on September 12, 2014 by AtlasSigns.